An annual award &ldquo;to the player adjudged to be the most valuable to his team.&rdquo; Winner selected in a poll by the Professional Hockey Writers&rsquo; Association in the 30 NHL cities at the end of the regular schedule. History: The Hart Memorial Trophy was presented by the National Hockey League in 1960 after the original Hart Trophy was retired to the Hockey Hall of Fame. 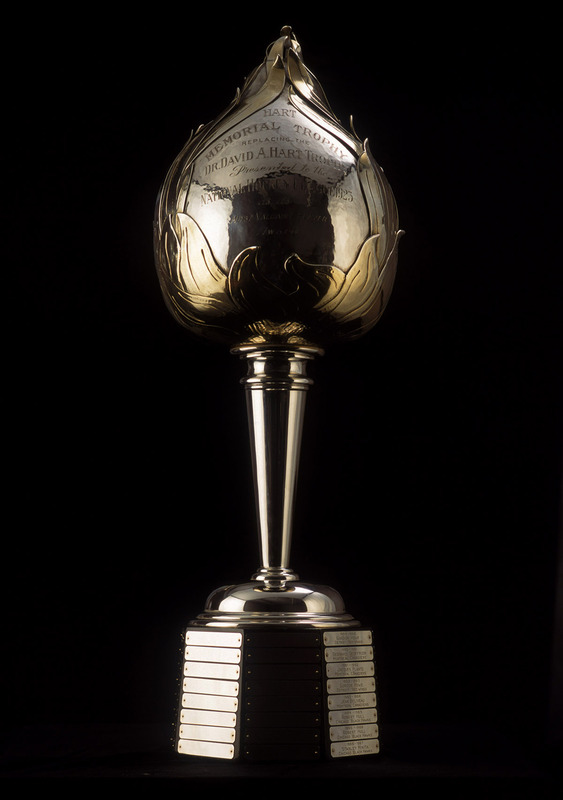 The original Hart Trophy was donated to the NHL in 1924 by Dr. David A. Hart, father of Cecil Hart, former manager-coach of the Montreal Canadiens. Right winger Patrick Kane is the winner of the Hart Memorial Trophy. Kane is the first American-born winner of the NHL MVP Award and the first Chicago player to win it since Stan Mikita in 1968. Kane received 121 first-place votes and appeared on all 150 ballots cast. He received 22 second-place votes, five third-place votes and two fourth-place votes for a total of 1,395 points. Sidney Crosby of Pittsburgh was named on 145 ballots, with 11 first-place votes, 64 seconds, 31 thirds, 24 fourths and 15 fifth-place votes for a total of 800 points. Jamie Benn of Dallas received eight first-place votes and had 637 points to finish in third place. Braden Holtby of Washington (eight first-place votes, 292 points), Joe Thornton of San Jose (zero, 267), Alex Ovechkin of Washington (two, 212), Florida&rsquo;s Jaromir Jagr (one, 60), the Kings&rsquo; Anze Kopitar (one, 53) Ottawa&rsquo;s Erik Karlsson (zero, 44) and Ben Bishop of Tampa Bay (one, 42) round out the top ten. Kane, who also won the Art Ross Trophy and the Ted Lindsay Award, posted career highs in goals (46), assists (60) and points (106) to power the Blackhawks to their eighth straight playoff appearance. He notched at least one point in 64 of his 82 contests (78.0 percent), highlighted by a 26-game streak from October 17 to December 13 (16 goals, 24 assists, 40 points) which was a franchise record, the longest by a U.S.-born player in NHL history and the longest by any player since Mats Sundin had a 30-game scoring streak in 1992-93.